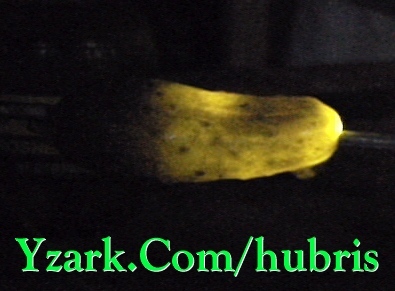 Research into using an electric pickle as a bright idea. The seminal work on pickle electrification by Hamburgen et al. (1989) http://www.research.digital.com/wrl/techreports/html/TN-13/ raised many further questions, of which this work will address none. Instead we propose to explore the zeitgeist of the electric pickle experience in a global context, limning as it were, the Jungian archetype of the Electric Pickle. In all its briny glory. There has been little sane theoretical or practical interest in pickle electrification in the last decade. Part of this disinterest was the characterization of this field (as implicit in the title of the original work) as 'Organic Illumination' while the greater part has been due to the Neo-Occidental conspiracy which ruthlessly suppresses all electric pickle related work through subtle innuendo and biting scorn. In this series of experiments, we followed the general procedures of Hamburgen et al. with some modifications as the series progressed. Some of the pickles were sliced in a variety of ways to better observe the effects of the electric arc, and to appease the onlooking mob. The copper electrodes of the Hamburgen work were replaced by aluminum ones (0.159cm dia.). The current was delivered through copper clamps at 120V AC (rms) and 60Hz. (ie deadmans linecord + alligator clips on roofing nails in blocks o wood do not try this at home) Sophisticated safety systems( $5.00 powerbar w/ 5A circuit breaker + trained ape with finger on button) minimized (nobody got hurt) the inherent dangers of the procedure. These experiments were recorded in digital video (mini-DV) format which allowed us 720x480 pixel resolution with full color and stereo sound. These were then transferred to various motion picture formats as shown in the next section. Results: will speak for themselves. Mere words cannot express the electric pickle experience. One must see the event live. We gratefully acknowledge the loving support of friends and family who rarely question our sanity. "Implications of Pickle Electrification for Causal Determinism" J. Dunne, F. Tempus, A. Fugit (2234) to be published in Proceedings of the 14th Annual Temporal Physics Conference, Theros, Greece 2234.